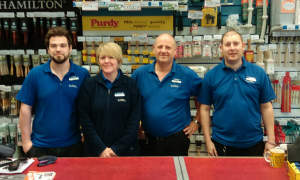 Once you’re here, you’ll find a bright, clean store and a warm welcome from the team. We enjoy a great relationship with our regulars. And we’ve accumulated a lot of product knowledge over the years, as useful for tradespeople as it is to our retail customers. We’re a good size store and offer a wide range of trade and designer paints, extensive choice of wallpaper patterns and plenty of decorating sundries, tools and equipment. You can also use our customer internet terminal to choose from the entire range of wallpaper and designer paints to order to store. 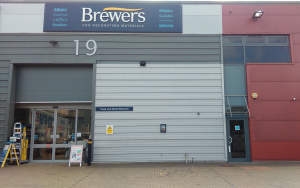 The Brewers Decorator Centre in Greenhithe is often referred to as our Dartford branch. In fact, we’re the Bluewater Shopping Centre side of the A282 and Dartford Crossing. Pick up the A206 from the A282 across the water, or the B255 from the A2 and Bluewater. You can see us from the dual carriageway, but the main thing to look for is the Quadrant Court turnoff next to the Croswater building. Then follow the road round to our parking area. There are assigned spots for disabled drivers. Heading away from Dartford on the A206, head over the roundabout with the Claire Causeway on your left. Quadrant court is the first turning on the left. Travelling along the A206 away from Greenhithe, continue along until the roundabout and take the 4th exit back on yourself. Quadrant Court is the first turning on the left.